Today, I would like to show you a wiring mod for Les Paul, SG and similar guitars. I designed it to make my SG more distinct and aggressive on the bridge position. On the neck position it's still a typical Gibson - fat and full. Another interesting thing in my guitar with this custom wiring is the centre position of the switch - bridge and neck. In this configuration, my SG has got a wide frequency range, it sounds very acoustically. All you need to have to make it is a DPDT on-off-on toggle switch and two capacitors (ceramic or film) - 4,7nF and 5,6nF. 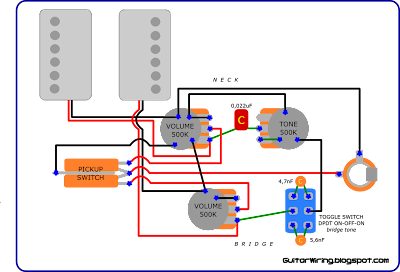 The circuit for the neck pickup is just typical. The modern Gibson's way of guitar wiring. The part for the bridge pickup is customized. I swapped the tone potentiometer for the DPDT switch. It's a kind of tone controller. In the centre position, the switch will be on „off” mode. By moving the toggle up or down, you will chose one of tone capacitors, which will start filtering out a little bit of treble. The reason why I made this kind of guitar tone control is impact of potentiometers. With a standard configuration (volume + tone) the wiring would be more warm and smooth. As you can see, I used only one pot (volume) for the bridge pickup, so I reached a quite bright and distinct tone. The bridge pickup wiring still have some tone control options, because there is my toggle switch with capacitors.